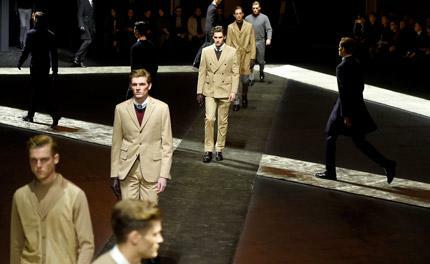 Mood board: In celebration of Brioni's 70th anniversary, creative director Brendan Mullane took to the runway for the first time in Milan's impressive Castello Sforzesco, plucking patrician elements from storied Spanish riding schools as well as the early 20th century Wiener Werkstätte artistic movement. Best in show: Our favourite pieces were the long, lean belted officer's coats that had a buttoned up, regimental feel to them. But kudos go to the creative director for the sumptuous knits that came dusted in real 24 carat gold. Finishing touches: Shaved mink scarves, cut flat like cross-cross paper in two tone navy and burgundy, were the perfect toppers for sleek coats and cropped cashmere jackets.